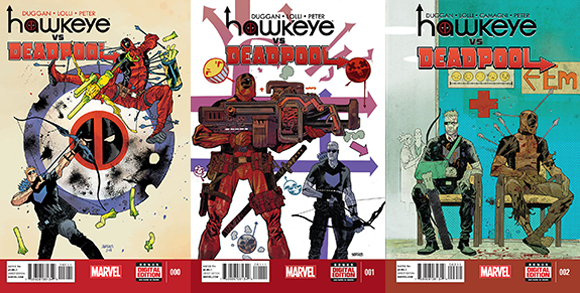 Hawkeye vs. Deadpool is a love letter from Gerry Duggan & Matteo Lolli to Matt Fraction & David Aja. It’s a blessing and a curse. If you happen to be in that cross-section of fans who absolutely love both Duggan’s Deadpool and Fraction’s Hawkeye, then this is your thing. But I can’t help but imagine a future scenario in which a new reader, a Deadpool lover, picks up this book while unfamiliar with the Hawkeye run it references. This sad hypothetical person will never laugh at the Pizza Dog jokes. Is this a huge problem? Not really. This is a comedic book, and comedy is often bound by temporal limitations. It’s a good thing you and I live in the here and now–we get it, we can dig it, we’re hip and with it. 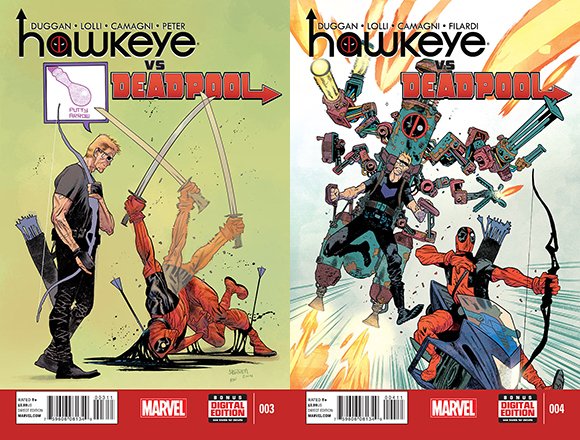 So let’s explore this wonderful adventure entitled Hawkeye vs. Deadpool from the fabulous team of Gerry Duggan, Matteo Lolli, Jacopo Camagni, and Cristiane Peter! The plot’s not much. Deadpool, Clint, and Kate team up to solve some guy’s murder. Black Cat’s involved. Jokes are made. Laughs are had. The good guys thoroughly bludgeon the bad guys. There’s probably a moral to be learned. This isn’t a complicated story. The story is really just a delivery system for jokes, and luckily Hawkeye vs. Deadpool has some good jokes. In particular, Lolli pulls off some truly enjoyable visual gags throughout the series. Kate’s reaction to Deadpool’s face stands out as an early highlight in issue 1, and it only works so well because Lolli sells it with a wonderfully rendered silent reaction from Kate. The sequence of Kate Bishop firing an RPG in issue 3 probably stands out as my favorite in this series, wherein a tiny Kate fumbles in the background with her new weapon. There’s a great use of framing by Lolli to make sure the joke feels “hidden” while really being impossible to miss. And then we have an over-the-top action finale in issue 4 where Deadpool, wearing Hawkeye’s old costume, comes to the rescue on sky-cycle. When Hawkeye vs. Deadpool is at its best, Lolli is there. This does lead to a frustrating problem, though. The pencil duties are split between Lolli and Camagni, and they do not share similar styles. You can even make a fun game of finding the innumerable differences between their styles. That’s one way to go. Or you can shake your fist at an empty sky and scream fruitlessly at the editorial gods, like I enjoy to do on occasion. I don’t care to disparage Camagni, his art is good, but he’s different. He opts to show Deadpool’s nose when Lolli does not. That seems minor doesn’t it? Yet suddenly Deadpool comes off a touch more clownish. Artists do make these decisions for a reason, after all. Throwing a second artist into the mix is really just a deadline thing, and I can try to be understanding, but that doesn’t make it less frustrating to see signs of a book facing deadline problems. On Camagni’s first page in issue 4 he draws Black Cat in the wrong costume. It’s only wrong for that page, but that’s almost more troubling. Did Camagni catch the mistake himself? Did an editor? What happened here? All we know is that for whatever reason Camagni didn’t have time to fix those two panels. It sounds like nitpicking, and it is, but that’s what I do here. It all comes back to one of my most common complaints: this book is too long. Once more a story is dragged out for trades, but this is not a series that needs five issues. It doesn’t really have five issues worth of jokes, and that’s too bad. But maybe if this was a shorter series then deadlines wouldn’t become a problem. The jokes might be tighter. Maybe a single penciler could handle it. The heavens would open up. We’d all have a sky-cycle in our garage, and a bow on our back. It would be a utopia, a utopia where we would all be Hawkeye. Yeah, that would be great.